TÜV SÜD is responsible for the certification of design of the Floating Wind Turbine, comprising substructure design, verifications of motions and stability, mooring design, transport and installation phases and manufacturing specifications. The certification of design will provide the basis for a successful development of the concept and a safe deployment of the Floating Wind Turbine at sea. Enhance industrialization capacity for serial production, allowing for a full on-shore assembly of the overall integrated substructure and wind turbine. Maintain low-draft (<9m), low height (<60m) and low width (<40m) working conditions during the full on-shore assembly of the complete system. Ensure full independence of scarce and costly heavy-lift or special purpose vessels during the complete offshore installation process. Generate a simple and reliable installation process. Allow for direct scalability of the system and its installation process for the next generation 10+ MW wind turbines. Profit from the proven structural efficiency and economy of precast concrete. Through the use of structural concrete, generate robust, reliable and virtually maintenance-free marine constructions. Maximize independence from soil conditions, minimize seabed affection. Large water depth applicability range for deep offshore (>50m water depth). Significant material reduction. Current designs include a significant material reduction when compared with other state of the art technologies. Independence of special purpose vessels. No heavy lifting vessels or scarce auxiliary means are required in the proposed manufacturing and installation procedures. Optimized construction process. The design allows for a low-height, low-draft and low-radius construction process. Full onshore construction. Minimize the risk inherent to these operations. Wide usable range of water depths. It can be installed on depths >50m. LCOE reduction. Combining the above we expect to have an impact in the LCOE. Minimal seabed affection. Noiseless installation and minimal footprint on the seabed. Reduced carbon footprint. Use of concrete over steel. 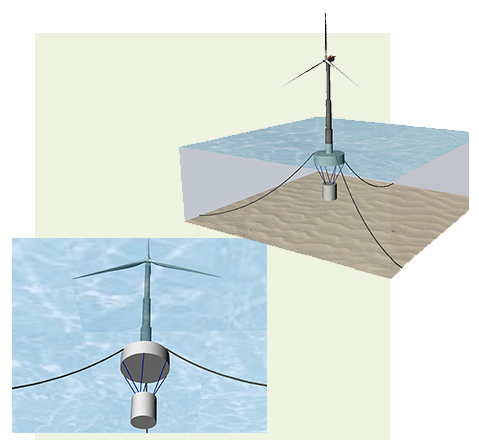 Cost-effective wind energy in deep waters. The solution would allow for wind energy to expand to deeper waters, allowing for many EU countries to take advantage of this technology. Ready for the next generation of wind turbines. Designs adapted for the next generation of wind turbines of 10+MW. Wide and stable supply chains. Supply chains of reinforced concrete are less dependent on steel prices and take advantage of local resources. Cost reduction. A significant cost reduction is expected when we compare the current design with other state of the art technologies. Independence from scarce installation vessels. No special purpose vessels are required for the installation. Onshore turbine installation. Current design allows for a complete onshore turbine precomissioning. Maintenance-free structure. Current design includes structural concrete as the main material, which allows for a virtually maintenance-free structure lowering OPEX costs significantly. Possible life extension and repowering. The floating platform is being envisioned for a service life of 50 years, which would allow for life extensions when compared with the 20-25 years of service life of a wind turbine.